train, or vice. . .
I’m sitting here writing this, completely uninterested in going to jiu-jitsu class tonight. I probably won’t even finish writing this until sometime later this week. I’m physically and mentally tired, my hands hurt, a wrist is slightly sprained, and I’m getting over a cold. The roads are not so hot and all kinds of extra-curricular classes are getting cancelled. Going home and vegging in front of the TV and having dinner with my family sounds really good, but I’m going to class anyway. There’s something inside that keeps me going, and I’ll describe it in case there’s a blue belt wannabe that is thinking about bailing on class. When I first started training Brazilian Jiu-Jitsu, I was constantly learning. I also felt like I was racing against the clock since I didn’t start any kind of martial arts until my late thirties, and I wanted to get good at BJJ and get my black belt before I was 50. Between the clock and the fun, I easily justified 4-5 days a week, despite an hour long drive to and from the academy. Then my body started to revolt, and I had to take rest days, but I was still training 3-4 days a week. Then I had my first significant injury, something in my shoulder. I waited a week, going nuts that I couldn’t train, then went back in and tried to take it easy on that shoulder. Not long after, I discovered that armbars and lots of elbow stress gave me golfers elbow. I went to a sports doctor who banned me from Jiu-Jitsu for a month. Again, I went nuts that I couldn’t train. During those periods when I couldn’t train, I was constantly wondering what I was missing. What new things would the other students know that I now didn’t know? Every day I was off the mat was a day my goals were deferred. I even looked for schools I could train at when I went on vacation. During that honeymoon period, wanting to train was easy. It was bad when I couldn’t train, but the constant desire was there. When the honeymoon is over, there must be other things motivating you. To a certain degree, there’s an element of pride here. It’s not carnal pride, but more like professional pride where if a job is worth doing, it’s worth doing right and having your handiwork show as an example of excellence, even if nobody knows who did it. For jiu-jitsu, this meant being the last guy off the mat and always looking for an opportunity to learn from my training partners. When a new student would come in, I made sure to try to partner with them and help them out as much as possible. These were the things I respected in other quality jiu-jitsu instructors and students, so I wanted to develop those traits in myself as well. I view being a mat monster not as someone who goes out and crushes everyone in sight, but more as someone who exemplifies all that is good about jiu-jitsu, including crushing opposition when appropriate. Being oriented towards this goal underlies my decisions about when to train. Through all my training, especially early on, I saw students that would take month long (and longer) breaks. Or other students that would train just once or twice a week. I saw my progress compared to theirs, and I was clearly moving forward as they appeared to stand still. I didn’t want to be the student that the professor looked at and said “there’s a guy with potential, but a weak training ethic.” I wanted to be the guy who was old enough to be your father and still on the mat rolling hard when you left. Most of the folks I rolled with said I didn’t seem too bad with all the time off. Realistically I think it was more seeing how the guys I was close to progressed steadily during my absence. That was probably the biggest thing I noticed. “That could have been me” syndrome. That’s one of the big things that keeps me training no matter what. I don’t like that feeling. I already have a solid 15+ years worth already. I wanted to start training 20 years ago, but couldn’t until 4 years ago. It also doesn’t escape my attention when I run into multi-degree black belts that are roughly the same age as me. I have been developing my professional software engineering skills since I was 13, just as these black belts have often been training since their teens. When you spend close to 30 years doing something with focus, you tend to be good at it. I didn’t have the opportunity to train jiu-jitsu until recently, so I’ll have to work twice as hard to even get near the people who have been training for so much longer than me. My opportunity to train is now, and I’m not going to squander it. Am I in physical danger of injury if I train today? This includes travel hazards or aggravating existing injuries, and also includes the related: Am I going to inflict my ailment on someone else? Am I ignoring other responsibilities that can’t be deferred until a rest day, such as work, family, finances? If either of the above are yes, can I swap days of rest and training this week to keep my weekly averages the same? Notice: nowhere on the list is “Am I hungry”, “Am I tired”, “Is there a good TV show on tonight”. Weekly averages are important to me since it gives me a short term goal to shoot for that is easily measured. There are times when I willingly back off the averages, but it’s never been less than twice a week. Right now I teach two days and train two days. Next month it will be teach three days and train two. Each week, if I miss a day of training and can’t make it up that week, I don’t try to make up for it the next week. There’s no penance to be paid. Your metrics will be different, but ideally they should not involve decisions that are based on feeling. I don’t know of any success stories that involve “I just worked towards my goals when I felt like it”. There should be a goal for your training, and only serious unalterable events should prevent you from achieving those goals. I will never fault anyone for their chosen training schedule. 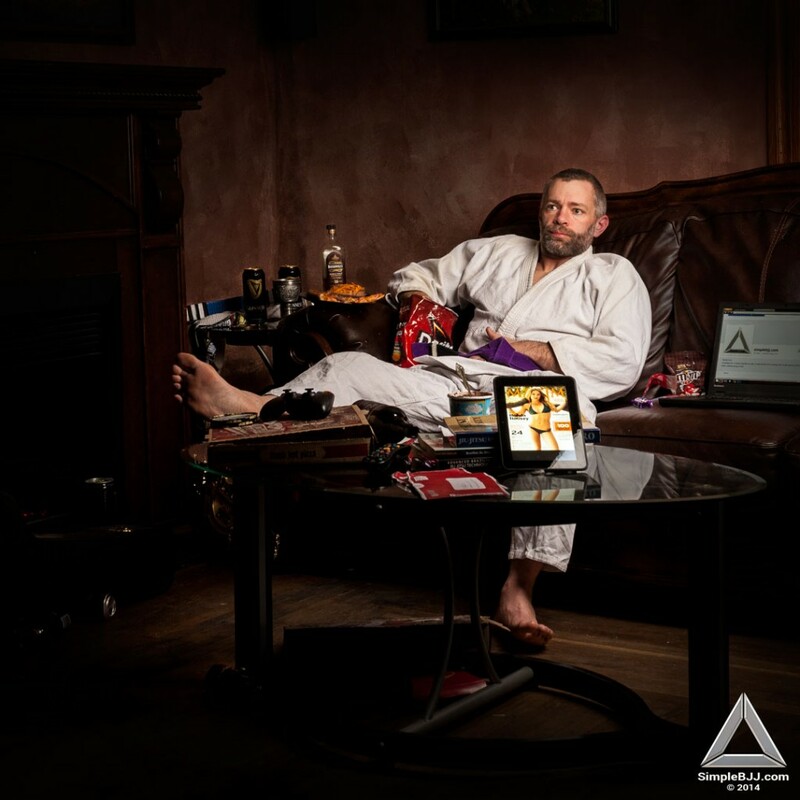 I am thoroughly addicted to jiu-jitsu, but there must be balance. Every person is responsible for their own priorities, and while I do my best to encourage students to get in and train as frequently as possible, reality is that personal issues will take precedence. Family, health, finances. . .all are good excuses to skip jiu-jitsu. When they come back, I’ll give them a smile and tell them how glad I am they are back in the academy. There are no penalties; there’s just more work to do. For me, things like health have to be at a breaking point before I will take time off. Discomfort is something to be compensated for. I don’t tap to discomfort. I never want to think to myself, you know, if I had worked just a little harder, maybe I could have done something even greater. I never want to be the “pretty good” black belt that lives with a small voice in his head that says “I coulda been a contender.” I want to look back and see that the only thing that kept me from my goals were impossible obstacles that would have stopped virtually everyone else. “Make good choices,” I say to my kids. When you are deciding what your jiu-jitsu goals and schedule should be like, make good choices. Jiu-jitsu will enrich your life by providing health, stress relief, and self discipline. Balance the benefits when you make your daily, weekly, and yearly priorities. I keep my training decision tree simple. There is some flexibility on a weekly basis, but in general, the simple answer 99% of the time is just “go train.” Every time I want to skip training, every time I’m tempted to do less than 100%, I submit that thought and hold until the taps get desperate. When we have shuffled off this students belt.